It’s hard to argue that the biggest standout of Oregon’s Spring Game was two-way player Charles Nelson. The sophomore’s speed and athleticism was felt on both sides of the ball, dazzling more than 35,000 fans in attendance. Head coach Mark Helfrich praised Nelson after the game, impressed by his knowledge and leadership for such a young player. Charles Nelson makes an impact at any position he plays. Nelson did just that and was a favorite target for quarterback Jeff Lockie, on 5 receptions for 144 yards, in addition to 2 touchdowns. Defensively, Nelson was similarly effective, recording 3 tackles and making an incredible, acrobatic interception as a defensive back. As FishDuck.com sports writer Caleb Couturie noted, Nelson was the best athlete on the field both offensively and defensively. While the stats show how effective he was, the eye test demonstrates how Nelson’s explosive athleticism makes him one of the most intriguing young players coming out of Spring football. Nelson has proven that he can play multiple positions, as he was a special teams standout last year. The question is — what positions will he play this season? 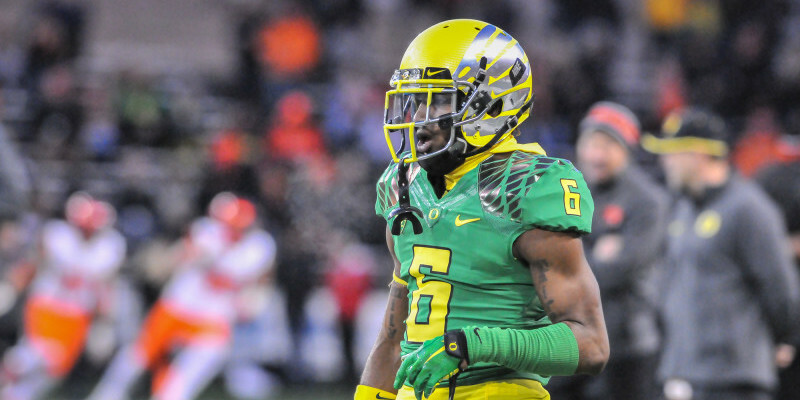 All Spring, Oregon coaches have indicated that Nelson is making the transition to defense. During the Spring Game, he was regularly looking to the sideline for help. It’s obvious that he’s still learning the position, but at the snap of the ball, Nelson’s ability has proven he can fill a defensive gap in the lineup. Oregon’s depth on offense is the main reason for the switch. It’s not that Nelson is an ineffective receiver, as evidenced by the his performance, but a focus on defense will allow him maximum playing time. Whatever the case may be, there is a bright future for Nelson as an Oregon Duck. As the star of Saturday’s game, Nelson has started his sophomore year with a bang.